You are in: Home > Places > G G Bonser, Kirkby-in-Ashfield, Transactions of the Thoroton Society of Nottinghamshire, vol XLIII (1939). 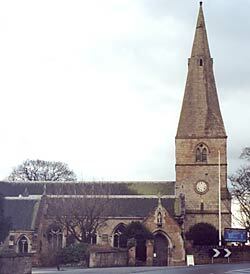 St Wilfrid's church, Kirkby-in-Ashfield was rebuilt after being largely destroyed by fire in 1907 (photo: A Nicholson, 2004). ON the eastern boundary of the great forest of Sherwood and on the edge of an escarpment over­looking a valley dividing Nottinghamshire from Derbyshire, lies the parish of Kirkby-in-Ashfield. At the head of a bay in this ridge stands its ancient church or, rather, site, for the building was burned down by the act of an incendiary on January 17th, 1907, but has been beautifully restored by the Duke of Portland. 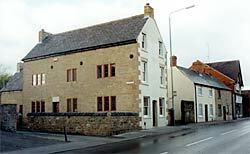 The rectory is close by its side. At the bottom of its lawn the infant waters of the Erewash or Irwash gush forth, and running down the valley form, for many miles, the boundary of two counties, giving its name to the earliest branch of the old Midland Railway. As the name of the parish indicates, it was partly a Danish settlement (Kirkby=village with a church), and at the time of the Norman Conquest was held as to 10 bovates by a landholder named Levenot, and as to 2 bovates by Alvric. The suffix "Ashfield" is a district name and indicates "feld" with ash trees—"feld" being "openland." William the Norman soon ousted Levenot and gave the lands to Ralph, the son of Hubert, who disposed of them to the great Norman family of D'estoteville. This family of Estoutevilles, writes Abbe Cochet in his Eglises de Yvetot, was certainly one of the most noble and illustrious of England or Normandy. It had a large and most interesting connexion with the ancient Kirkby; it had a market and a fair granted to it in a.d. 1259, and the shaft of the market cross is still standing. But in 1284 the then Robert de Stuteville showed great disobedience and contempt in not coming upon the king's summons to aid him in his last expedition into Wales. He was pardoned on paying a fine of 100 marks for every knight's fee which he held, and King Edward I spent Thursday, 19th February, 1292, at the castle in Kirkby on his wayfrom the Bek's at Pleasley to Codnor Castle, the seat of Lord Grey. The barony of Kirkby held fifteen knights' fees, and it is manifest that a lord who could muster fifteen knights with "one man, horse, hanbergeon, cap of iron, lance and sword," was a man of great importance. To-day, all that remains of the castle of this great nobleman are some mounds in the field at the west end of the church, on a commanding site, but not of large extent. In 1340 Robert de Stoteville forfeited the manor, and King Edward III granted it to John Darcy, called "le cosyn," justiciary of Ireland. In 1347 John Darcy "le cosyn" had custody of the Tower of London for his life, as had his son John in 1350. In 1345 he obtained a licence to make and enclose a park at Kirkby, and the fields on its site are still known as Kirkby Park. Probably he built a house on the site of the castle of the Stotevilles which was declared in 1310 "not valued because it greatly needs repair." In 1466 the manor passed to Elizabeth, a daughter of Philip, Lord Darcy. She married Sir John Conyers and carried the manor to that family, their descendant becoming Baron Conyers, a title now borne by Lord Yarborough, son of Lady Yarborough, elder daughter and co-heiress of the 12th baron of that name. Church Street, Kirkby-in-Ashfield (photo: A Nicholson, 2004). The family died out under rather tragic circumstances, and though a commission was issued by the Commonwealth government in 1649 owing to the failure on the part of trustees, their report was never acted on, and a public charity was lost for ever. The last descendants of the family emigrated from Sutton-in-Ashfield to the United States, and dropping the prefix [Fitz] became prominent in the affairs of the States, General Randolph being one of the officers of George Washington during the war of independence.